As somebody who enjoys basic, recreational baking when the holiday season rolls around — that is, cookies of all kinds, but not much else — I’m in awe of the really good bakers out there. If you can craft light, flaky pie crust that melts in your mouth, I’ll be a big fan. If you can bake an angel food cake that doesn’t partially collapse on one side, you’ve admittedly outdone the best baker in the Webner family, and I’ll sing your praises. But if you can bake brownies that smell so good that a large black bear will scale your back porch, stand up on its hind legs, balance on the railing encircling your deck, and start banging on the patio door in an effort to get a taste, then in the baking world that really takes the cake. OK, that was an incredibly bad pun, but the bear incident actually happened. This past weekend, in Avon, Connecticut, a woman was innocently baking brownies when she hear a pounding on the glass patio door. She looked up and saw a bear peering in, obviously angry that it couldn’t get at the baked goodies. The bear actually opened the screen door, but it wasn’t able to open the sliding glass door. The incident freaked the woman out, but eventually, after the woman and a neighbor made some noise and the frustrated bear wasn’t able to get in, it wandered away. I can see how the bear incident would be disconcerting, but I think the woman in question should take it as a compliment to her baking. And I want to know one thing that isn’t addressed in the article linked above — when is the woman going to publish that unbearably enticing brownie recipe? I loved elementary school when I was a kid. I loved my teachers, I loved the principal Mrs. Owens, and I loved the brick building, and the chalkboards, and the desks, and the old hallways that smelled of varnish and cleaning fluids. I always felt safe and happy when I was in school. It was where I went to learn from teachers and act in school plays and sing in the school chorus. The only small sign that there was a dangerous world outside the double doors was our periodic “duck and cover” exercise and trip down to the basement in the event of a nuclear attack. I cannot imagine what it would be like, as a grade school student, to walk down the school hallway and see a gunman shooting into classrooms. There could not be a more jarring disconnect, to my sheltered little world, than violence of any kind at a school. But that was the early 1960s, and this is 2012. 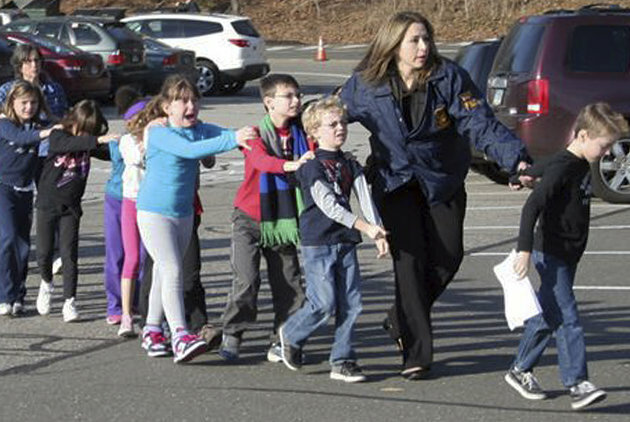 It seems like every year we deal with a horrible new school shooting tragedy, like the one this morning at an elementary school in Newtown, Connecticut that left at least 27 people dead — 18 of them students. 18 children gunned down at their schoolhouse! The parents of those 18 murdered children left with awful holes in their lives and a surging feeling of rage and disgust that a gunman would shoot down innocent children. Countless other little kids who survived, but who are devastated and traumatized, and countless parents who wonder what the hell they can do to try to keep their children safe and sound in this increasingly random, violent world. We know that what happened in Newtown could easily happen anywhere. Where have we gone wrong? How have schools been turned from places of order and learning into charnel houses and shooting galleries for deeply disturbed, heavily armed people? We need to figure out what has happened and fix it, fast. A society will not be able to endure for long if parents can’t feel secure about sending their children to a place of public education. It just breaks my heart that happy little kids sitting at their desks on a Friday morning, no doubt thinking about their upcoming holiday break, could be shot dead. What could be worse than this?